There is a 165-point inspection that must be completed before a Certified Pre-Owned Mercedes-Benz vehicle is ready to be purchased. This inspection helps the team at Mercedes-Benz know if the vehicle is ready to be driven or if there are issues with it that must be addressed before it can hit the road. There is a peace that you feel when you drive a vehicle that has a warranty attached to it and you do not want to do without that peace when you buy a used vehicle. 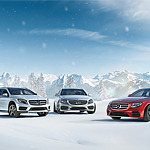 When you purchase a Certified Pre-Owned Mercedes-Benz vehicle, you will be set up with a warranty.